Wooden buckets can be crafted with any combination of lumber. Metal buckets are made by working a metal sheet on a tier 6 anvil. Wooden buckets can be used as a way of transferring water to devices such as barrels and large vessels, but cannot place flowing or source water. 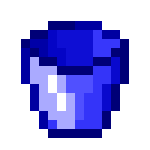 Right-clicking on a block with a wooden water bucket will place a thin layer of flowing water that quickly disappears. Wooden buckets are totally unable to pick up lava. Wooden buckets can also be used in the crafting of dough, as well as to transport liquids such as milk and vinegar. To quickly empty a full bucket into a barrel or large vessel, simply Right Click with the bucket on the side of the container. When combining flour with fresh water, the resulting dough will have double the weight. If the flour weighs more than 80 oz, crafting the dough will leave the flour in the crafting grid, minus the 80 oz used to create a max weight piece of dough. A female cow that has high enough familiarity can be milked once very 24 hours by using an empty wooden bucket to Right Click on the animal. Players can drink straight from a milk bucket by holding Right Click to replenish some thirst and the dairy category of their nutrition profile. Blue steel buckets can only pick up and place lava source blocks. They are not able to transport any other liquid. Red steel buckets can only pick up and place water source blocks. They are not able to transport any other liquid. Red steel buckets filled with fresh water can also be used to craft dough. Allows crafting of vanilla iron buckets. 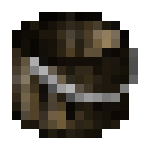 Added temporary wooden bucket recipe. Wooden buckets can be used to gather milk. Added Red Steel and Blue Steel Buckets capable of transporting water and lava source blocks. Buckets require a metal sheet of the appropriate type to craft. Buckets can be used to directly fill barrels. Players can drink milk buckets. All water buckets (salt/fresh, wooden/red steel) can be used to fill vanilla cauldrons. For a short period of time during v2 Build 33 of TerraFirmaCraft, wooden buckets could be used to place water that would flood entire worlds. This page was last modified on 9 July 2015, at 18:57.